Home » Specialty Appliances » What is the Best Raclette Grill to Buy? A Raclette is a Swiss/French meal that consists of meats and/or vegetables that are first grilled and then topped with melted cheese. The entire meal can be assembled by using just one appliance called a Raclette grill that can melt a variety of cheeses in small pans and grill a variety of foods at the same time. You then scrape the cheese onto the grilled foods before eating. This is a great casual dining concept for the entire family or even a small party, similar to a fondue meal, as each diner can melt and grill his/her own foods. But what is the best Raclette grill to buy? An electric Raclette grill will have one power source that provides heat to the top grill and the bottom Raclette pans. The grill top can be more modern with a non-stick surface or it can be high-performance with a granite surface. If you want to entertain with Raclette, you should have at least 6 pans to be able to have a good amount of cheeses in several varieties. Being able to adjust temperature settings is a must, as you want to keep cheese melted but you don’t want it to burn, and you want your grilled foods to be done just right. Keep in mind that the grill top on most of these units are not meant to work like regular electric grills, but you will get good results on thin cuts of meat and veggies. Our selected best Raclette grills are ideal for small parties at home, but if you’d like to see some more options, check out the range on Amazon. The 1200 watt Hamilton Beach 31602 Raclette Grill may not have a traditional look to it, but it is extremely functional and, better still, it’s the lowest priced rectangular grill on this list. In fact, if we were going to give a bang for the buck award here, this grill would take top honors, and wouldn’t look back. Now for you traditionalists, this grill won’t trip your trigger, but if you are just relaxing with friends in a raclette style, some meat on top, some gooey melting cheeses below, and a little beverage on the side, then you can’t do much better. Instead of a traditional granite stone on the top grill, you’ll get a very nice 11” by 11” non-stick coated griddle. It will perfectly cook thinly sliced meat, veggies and kabobs, and clean-up will be a breeze. Of course the lower plate will allow you to warm cheese effortlessly, and then you can scrape or pour it onto the goodies cooked above. This unit is capable of serving 8 people, and each cooking tray is non-stick, while each paddle is heat resistant. The trays and paddles are dishwasher safe. There is an adjustable temperature setting, but there is no on or off switch, so you’ll have to unplug it to turn it off. The cord is a bit short, so you may need an extension if an outlet isn’t near. It must be stressed that this Raclette grill cannot be used like a normal tabletop grill. Not only is it not suitable for steaks or chops but eggs will stick to the surface. Stick to just Raclette-type foods and the non-stick coating won’t peel off since you won’t have to scrape food off the surface. The reality is that for a great raclette grill at an even better price, if you are not a traditionalist, this grill has to be first on your list. It comes with a 1 year limited warranty. The Hamilton Beach raclette grill above does not have a granite stone top grill, so as stated before, for traditional raclette celebrations and more versatility with food types, you’ll need to look elsewhere. And that’s where the Swissmar KF-77081 Stelvio Raclette Party Grill comes in. It does have a granite stone top, so you can be traditional and have a great get together with friends or cook up a nice breakfast of eggs, pancakes, etc. for a weekend with the family. The granite top means you can scrub it down with detergent and scrubbie pads, and you won’t have to worry about scratches or peeling off a non-stick coating. In that respect, this is one of the most durable units here. The stainless steel bottom looks elegant and will fit in well with virtually any decor. The heat control is variable, and you can turn the unit off without having to unplug it. It also comes with 8 cheese pans with stay-cool handles and spatulas. Swissmar is one of the foremost makers of Raclette grills, and both their experience and durability shows with this model, and as with all Swissmar Raclette grills, it come with a 5 year limited warranty. If you are looking for tradition in a modern and easy to use electric style, this gets our best Raclette grill review. 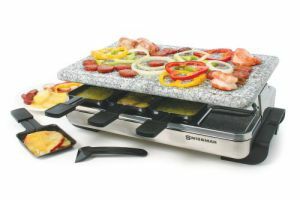 For unmatched cooking versatility in a Raclette grill, check out the Swissmar KF-77043 Classic. Although it does not have a traditional granite top, it does have a top grill that is uniquely different. One side of the grill is completely flat and it is perfect for frying eggs, making pancakes or scrambling eggs. Reverse the top and on the other side you’ll find a ridged griddle, which is great for searing steaks, making kabobs or frying bacon. No other Raclette grill gives you that type of cooking versatility. The base is anodized aluminum, and it is painted in several colors, including red and black, so you’ll be able to find one that coordinates with any color combination. The Raclette pans and spatulas are the same as the ones from the Stelvio above. The thermostat is infinitely adjustable for the perfect warming or cooking temperature every time, and it even has an on and off switch for added convenience. So, if you want a raclette grill that can be used for every day cooking, at breakfast, lunch and dinner, this Swissmar Classic will tackle all of your cooking jobs in one appliance. Featuring one of the neatest innovations in raclette grills, the Swissmar KF-77073 Swivel Raclette Grill takes this appliance to a whole different level. The “swivel” in its name makes this appliance unique. Unlike other raclette grills that have one large grilling surface on the top, the grill on this unit is split down the middle lengthwise. Each side has its own power control, which equates to having two separate grills in one. One side is an actual hot stone, and one side is made of aluminum with a non-stick coating. The stone grill works better for veggies and grilled meats while the non-stick side works better for frying or sautéing. Although that is a unique feature in itself, it gets better. Those separate grills can be attached end to end on the swivel post, and once attached, they can be swiveled into any position needed to fit a table or a place setting. For example, if you have people sitting on two sides of a table, the long end and the short end, you can turn the grill into an “L” shape to accommodate both sides. If your table is placed against a wall corner, convert your grill into a “V” shape and make a little grilling nook. If people are sitting inline at a table, just extend it out fully in a “–” shape, and everyone will have access to the grilling surfaces. The only small drawback with this unit is the absence of temperature control. Once you plug it in, the grill tops are maintained at a nice and even temperature throughout. Most customers say that it is not a problem, but you won’t be able to sear steaks or make crispy bacon on it. Yes, this is the most expensive unit here, but with the grilling surfaces being able to oblige virtually any table setting, no matter where you put it, this Raclette grill will always fit. If you are into the serious Raclette experience and want to “wow” everybody with the most unique Raclette grill here, then this is a must have for any Raclette party. As we all know, traditional Raclette includes a large rectangular grill on top of a cheese melting warming tray beneath. However, they can take up quite a bit of space and can swamp a regular dinner table. If you’re looking for something more compact for a small dinner table and a small dinner party, you can get the Toastess TPG-315 Raclette Party Grill. Its main claim to fame is that the entire unit is round instead of rectangular, and with the least overall cooking space (8 3/4″ diameter) than any of the others, plan on putting this on a smaller table for a much more intimate setting. This is, by far, the lowest priced grill here, and it comes with 6 Raclette pans and spatulas for serving. That said, it is an extremely capable Raclette grill for cooking and warming. The smaller size means it heats faster and is ready sooner, and really, for a smaller get together on those occasional social visits, this small and adept little unit, may be all you need. The grilling surface is non-stick, and there is a power switch with an indicator light that is on and off capable, so you don’t have to unplug it when finished. It comes with a 1 year limited warranty and the entire top grill is removable for the easiest cleaning, both top and bottom, of the bunch.